I have been watching international teams practice during the World Juniors and other tournaments held in Calgary ove Christmas. This section will be dedicated to how various nations practice the same game. Closest player must pressure the puck in straight lines from the net out. Skate back when the puck is passed. Stick on the ice in the passing lane. Communicate. 1. A power play and a penalty killing unit at each end of the ice. 2. The coach passes in a puck from the line or from a face off dot. 3. Controlled scrimmage where everyone stops on a whistle. 4. If the puck is frozen, a goal or it is cleared put in a new puck. One consistent thing I see when watching the international teams practice at the IIHF World Junior Championships is that they play a game in each zone at almost every practice. Sometimes the coach organizes it as part of practice or the players start the game themselves when practice is over. The North American players will stay on and shoot the puck or practice skills but the European players organize games. The rule is the puck can't come out of the zone or the other team gets it. When you regain the puck you must make two passes before you can shoot. Sometimes only one pass is needed or various skills can be added. This is the Slovakian U20 Team. Shoot while skating and follow the shot for a rebound. Fake and build a wall to protect the puck. Block off the checker with your legs and back. 1. Get a pass from the coach at the blue line, skate in and shoot while moving then follow the shot for a rebound. 2. Goalie place a puck behind the net and the attacker fake and walk out while protecting the puck from the defenders stick. 3. Attacker skate to the corner and get a puck and walk in while protecting the puck and get a shot and look for a rebound. 4. Repeat the walk in from the other corner. This is a goalie warm up used at the start of practice. Hit the net. Shoot while skating. Follow the shot. 1. Players line up behind the blue line on diagonal sides of the ice. 2. Player 1 skate straight and shoot. 3. Player 2 skate to the middle lane and shoot. 4. Player 3 skate to the far lane and shoot. Shoot from the high slot area, follow the shot and screen for the next shooter. Protect the puck with the back. Get defender to reach or straighten their knees. A. 1 on 1 battle and go to the net. 1. Place the puck on the dot and race for it from the circle on the whistle. 2. Play 1-1 and -protect the puck and go to the net and try to score on the whistle. B. 1-1 Battle with passes to Jokers. 1. Race for the puck on the middle dot. 2. Battle 1-1 protect the puck and pass to Jokers. 3. Go to the net on the whistle. Number the players and alternate from one circle to the other to give enough rest and allow only one shot on goal at one time. Play the 1-1 battle with no passes first and then add passes to jokers allowed. With 4 players rotate. 1-4, 2-3, 2-4, 1-3, 3-4 12. Do the same sort of rotation with more players. Regroup with each D and support from about a half zone away. Give a target and face the puck. Pass hard and always give strong side wall support and middle support. Description:1. Blue F1 leave and pass to F2. 4. Red D2 pass to Blue F1 or F2. 5. Blue F's regroup with Blue D1 or D2. 6. Blue D's hinge and pass to Blue F.
7. Blue F's attack the far net vs either zero, one or two D.
*Options: vary the amount of F up to 3 or D up to 2. Add a dump in instead of a second regroup to work on breakouts or even a forecheck. Offensive player uses the net to protect the puck and faces the play. Move back and forth ready to pass or do a wrap around. 1. F1 is behind the net with a puck and F2 battles D1 to get open for a pass. 2. First only allow passing and then either a pass or a walk out. B. Game with a Joker Behind the Net. 1. Play 4 on 4 with the rule that goals must originate from shots on passes from behind the net. 2. Each team has a joker that must be passed to in order to transition to offense. 3. Play with 2 offensive F in the slot and one D at the point..
4. Man to man defense. Blues go one way and reds the other way. D pass and join the rush. Make the first play in the attacking zone early so there is a second play possible. Move quickly through the neutral zone. Hit the net and crash for rebounds. Defender delay the play. 1. Red D2 pass to Red D1. 2. Red D1 pass to Red F1 or F2 who attack vs. Blue D1. 3. Red D1 join the rush to make it 3-1. 4. Red D2 follow the play to the far blue line. 5. Red F1-F2-D1 shoot and rebound. 6. Blue D2 pass to Blue D1 who attack 3-1 vs. Red D2. 7. Continue this flow end to end. Face the puck. Make the first play early so a second play is possible. Attack with speed. Crash the net for rebounds. 1. Blue F1-F2 Regroup with Blue D1-D2. 2. Blue F1-F2 attack 2-1 vs Red D1. 3. Blue F3 pass to Blue D1 or D2 who hinge and regroup with Blue F1-F2-F3. 4. Blue F1-F2-F3 attack 3-2 vs Red D1-D2. 5. Repeat the other way Red F1-F2 regroup with Blue D1-D2. Quick feet and shoot while moving. On the one timer follow through with the stick and front knee pointing to the target. B2 Defense Point Shots1. D1 get puck from along boards, skate inside the dots and shoot. 2. D1 get another puck then pass to D2 for one timer. 3. D2 repeat passing to D3. 1. F1 skate and pass across to F2. 2. F2 pass back to F1 who shoots while skating. 3. F2 repeats from the other side give and go with F3. *Screening and timing for rebounds can be added. Key Points:Players need to be able to handle the puck on both sides of their body and this requires loose shoulders. When you carry the puck with only one side of the blade you must skate around the puck and be able to rotate your core. Skating with fast hands and fast feet requires good cross over skills and loosens the shoulders. 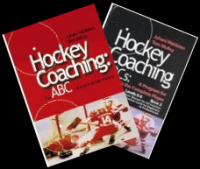 This is an exercise I learned from Jursinov the IIHF Hall of Fame Russian coach. Description:Leave from diagonal corners and do two circles in each zone in opposite directions. Exercises include: carry the puck only using the forehand side of the blade, only the back hand side of the blade, fast hands and fast feet, alternate facing inside and outside. Many other tasks such as backward skating are possilbe. Finish with a shot on net. 1. Blue F1 leave and pass to F2. 7. Blue F's attack the far net and the middle D join the attack making it 3-0. Face the puck. Attack with speed and follow the shot for a rebound. B202 Formation Two groups face each other across the neutral zone. A. B1 leave and give and go with Y2 then skate around the circle facing the puck and get another pass from Y2. Last shooter circle back and attack 2-0. B. Y1 leave and give and go with B2 then give and go with B1 then face the puck on the boards and get an outlet pass from B1. Y3 leave from the back of the other line and attack 2-0. After attacking one of two players could defend making it a 2-1 or 2-2. - Use this drill as a Shootout Contest. Face the puck. Get open for a pass and give a target. Goals on one timer shots. 1. Offensive team must pass within one second. 2. Goals must be on one timers. 3. If the puck goes outside of the zone the other team gets it. 4. On transition to offense there must be at least one pass before you can shoot. Always face the puck. Shoot before the hash marks and follow the shot for a rebound. Circle back and rebound for the next shooter. 1. A skate with a puck toward red line. 2. BA pass to B, RA pass to C, GA pass to C who passes to B. 3. A skate laterally always facing the puck and get a return pass. 4. A shoot with the feet moving. 5. A follow the shot for a rebound. 6. A circle back and rebound for the next shooter. 7. D repeat from the other side. *After everyone has gone through all the options rotate the passers in the nzone. Other options are give and go with the next shooter or defend 1-1 with the next attacker. Pass hard while skating. Give a target and call for the puck. Shoot to score and follow the shot for a rebound. Do everything at full speed. 1. D1 pass to D2. 2. D2 make breakout pass to F1. 3. F1 skate to big ice and pass to F2. 4. F2 skate to big ice and drop pass to F1. 6. F2 skate around circle - get pass from D1. 8. F1 follow and get pass from F1. 9. D1 take a point shot. *Do this drill from both ends on opposite sides of the ice. Always face the puck. Defender must see the puck and cover an attacker. Defender keep the stick on attacker when looking for the puck so you don't lose him. Tie up sticks on defense and keep the stick free on offense. 1. Coach pass to player behind the net. 2. Two attackers are covered by two defenders in front of the net. 3. The coach will give them two passes to try and score. 4. Rotate from offense to defense. Goalie must quickly defend the open net. Players must transition right away from offense to defense and defense to offense. Extra players on the bench. 1. Play from 1-1, 1-2, 2-2, 3-2, 2-3, 3-3. 2. Each team shoots on one net. 3. Pass to team mates on the whistle. One touch pass. Shoot while skating and always follow the shot for a rebound with the stick on the ice. Greens on one side and whites on the other side at the red line. Each shoot at a different net. 1 pass across to 2, 2 back to 1, 1 back to 2 back to 1 who goes in and shoots with the feet moving, follow the shot for a rebound and then circle back to rebound the next shot before returning to the line. - Same two give and goes and then give and go with the last shooter who is on the goal line and shoot without handling the puck. Pass to the next shooter and after you pass step out and look for a rebound. This is a great way to warm everyone up at the start of a practice. Defense do the various breakout options and read where the pressure is coming from. Pass the puck back to the coach and move thru everyone. Forwards pass with good technique and eye contact. Goalie coach work on technique and rebound control. A. Defense work with two doing breakout options vs one forechecker. B. Forwards lines of 3 work in the neutral zone. 1 - Stationary pass with eye contact. 2 - Pass while moving always face puck. 3 - #8 around partners give and go. 4 - Keepaway 2-1 in four areas. 5 - Two lines move and pass to other two lines on the blue line. 6 - Two lines of 3 pass while skating on one side of the neutral zone. C. Goalies work with coach at one end. Face the puck at all times and give a target. Shoot while skating and follow for a rebound. Pass firmly. Done from both sides at once. Two D and two F leave from the middle at each end. 1. D1 get a pass from the circle. 2. D1 hinge and up to D2. 3. D2 pass to F1 or F2 not covered by coach. 4. F1 pass to F2 who attacks and shoots. 5. D2 gets a new puck from the circle and passes to F1 who now attacks and shoots. 6. D2 follow attack and get a pass from F2 and shoots from the point while F1-F2 screen. A friend Mike Tschumi who played in Switzerland for ten years showed me this the othe day and we did it at practice last night. It is a good warm up drill for passing. One touch the puck in the middle of the blade and follow through with the top hand away from the body. Start rotating clockwise and then switch to counter clockwise. A. 1 and 2 one touch five times 6-12 o'clock. B. 2 pass to 3 at 3 o'clock. C. 3 one touch across to 2 at 9 o'clock. D. 2 one touch to 4 at 12 o'clock. E. Repeat with 4 passing to 3 x 5. Face the puck, gain the big ice and pass wide. Follow the shot for a rebound. Hit the net and attack with speed. 1. F1 and F2 leave from middle circle and regroup with D1. 2. F1 and F2 attack and shoot at far end D1 follow the play. 3. Forwards follow for a rebound. 4. F1 get a new puck in the corner and cycle it back to F2 and go to the net. 5. F2 pass to D1 at the point and go to the net. 6. D1 skate inside the slot and shoot. *Either forward can get the puck first. First forward screen and second skate for a shot pass. Option is forwards cycle and attack once then cycle and pass to the point. The ice can be divided into two halves lengthwise which creates more speed and allows full ice drills and games on each side. B6 is the basic formation with a net on each side of the ice on the goal lines at each end. - One net on the goal line lined up with the other net on the far blue line. - One net in the goal crease at one end and the other net lined up with the face-off dot at the far blue line. -This variation allows for play in the entire zone. - In this variation the scoring team gets the puck and goes the other way and the team scored on must touch the blue line before defending. Use either Variation A or Variation B or you could combine them. Variation B gives a full zone to attack and defend in at each end. By dividing the ice down the middle you have the option of doing games and drills full ice, in one zone, 2-3-4 games at once or games and drills at the same time. I was rushing between the four rinks and the four practices going on at once and got a short clip but the description tells the other things that happened with the Russian U20 Team. Defensemen practice with a coach at one end of the ice. Do the breakout options, go, wheel, counter, reverse and over. 1. Coach shoot a puck in. 2. D1 shoulder check and get the puck. 3. D1 drive skate to back of the net. 4. D1 pass to the point or to D2. *All of the defense rotate being D1, D2 or D3. Add passes to D4 at the middle point and one timer shots. Give close support to the ball or puck. Defending team create speed through the neutral zone after the breakout. New defending team identify coverage when the attackers enter the zone. Three teams play full court or full ice. 1-Red attacks vs Green at one end. 2-Green breaks out and attacks vs. Black waiting at the other end. 3-Black breaks out and attacks Red. 4-Green rests at the original end. They keep this rotation and play a game up to 5. Start another game at 0-0 but switch who they attack first i.e. now Green attacks Red and Red attack vs. Black and Black vs. Green. This rotation can be used to practice team play at full strength and power play and penalty kill. Players on the sides stay in the ready position and keep the puck in play. Only use one puck as multiple pucks are dangerous when stepped on. Play about 20”. Cross ice game of 2-2 with one Joker from each team on the side. Extra players on the blue line keep the puck in. Rotation is: Jokers activate with one new player and the second new player becomes a Joker. Pointman should skate along the line and shoot instead of forward towards the defender. Get inside the dots and shoot. Move laterally in order to miss the shot blocker. Shoot off the ice over sticks low enough to hit the goalies pads and produce rebounds or create deflections. Use snap shots and one timers to get the shot off quickly. 1. Coach pass to 1 at the point who skates along the blue line inside the dot and shoot. 2. Coach pass to 1 at the point who passes to 2 at the far point and 2 shoots. 3. Coach pass to 1 at the point and 1 pass across to 2 at the far point who skates wide passes back to 1 who skates to the mid-point and shoots. *The coach alternates passes from easy to ones that are difficult to control. Play games with regular or modified rules and vary the amount of players. Use the blue or red line stripes on the boards as nets if there aren't enough goalies. This is a puck support - passing game with the rule that the players can only have the puck for one second. You can play even or odd man situations, add Jokers or play D200 games with players rotating in. Attack at full speed. Give a target. Follow the shot for a rebound. One player screen and one player look for a shot pass. Description:1. Defense start inside zone and forwards outside the blue line. 2. On the whistle D1 at each end drive the back of the net. 3. F1 and F2 come back for a breakout pass. 4. F1 and F2 attack the far ends from opposite sides of the ice and D1 follow. 5. F1 and F2 shoot and rebound. 6. F1 or F2 pass to the point and screen. 7. D1 drag and shoot. *Repeat with D2 passing to F3-F4 on the whistle. I add practices to the Drill of the Week Club as they are sent in. 5 new practices today. All times are GMT. The time is now 00:09AM.